As a national autism treatment provider, Trumpet Behavioral Health strives to provide valuable autism information. Autism spectrum disorder, or ASD, is a range of conditions that features difficulties with repetitive behaviors, social skills, speech and nonverbal communication. People with autism also have unique strengths and gifts. The American Psychiatric Association merged autistic disorder, Asperger syndrome, childhood disintegrative disorder and pervasive developmental disorder-not otherwise specified (PDD-NOS) under the umbrella of ASD in 2013. As the word spectrum suggests, the challenges and strengths of people with autism vary widely. Just as the presentation of autism varies, researchers believe that a number of genetic and environmental influences are responsible for the disorder. It’s critical for parents to be armed with relevant autism information. Children with autism often start to exhibit the most-obvious signs between two to three years old. However, autism can sometimes be diagnosed when a child is as young as 18 months old. Certain developmental delays that are associated with autism can be addressed even earlier. Early intervention, which we offer as a national autism treatment provider, is important because it drastically improves outcomes for children with autism. The following signs can help you identify whether your child might have autism. According to the Centers for Disease Control and Prevention, 1 in 68 children in the United States has autism, including 1 in 42 boys and 1 in 189 girls. 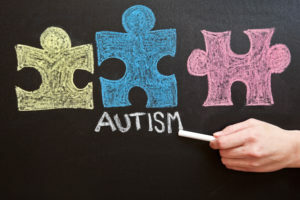 In addition to the symptoms of autism, these children are more likely to suffer from intellectual disabilities, gastrointestinal disorders, seizures, attention deficit and hyperactivity disorder (ADHD), sleep problems, anxiety and phobias. However, children can improve their behaviors and quality of life with ABA therapy and support from our national autism treatment provider. If you would like to learn more about autism and its treatment, please contact us.